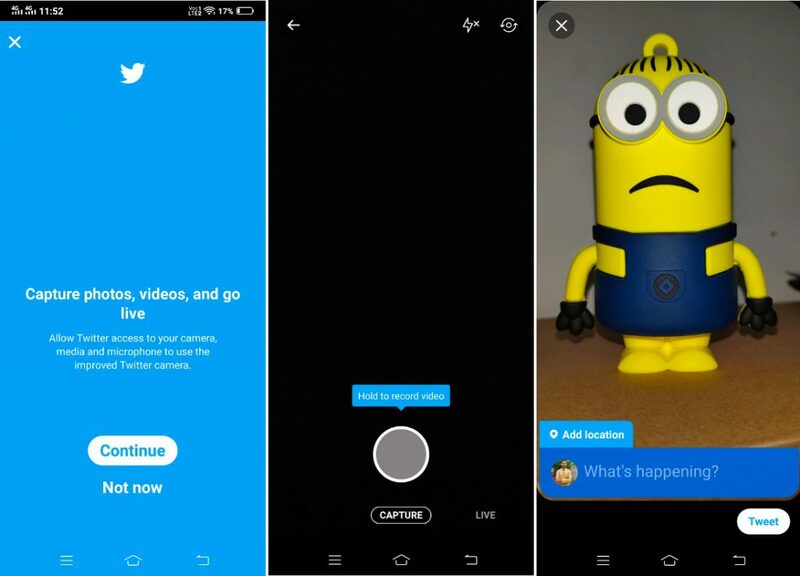 Twitter has started rolling out updated camera that lets you capture photos, video or live footage to start a Periscope livestream, just by swiping left from the home timeline. After you capture a video or image, you can add the location, add text on a colored label and Tweet it immediately. This Snapchat-like feature was announced at the SXSW 2019. Twitter will show this media in a larger in the feed with the image appearing before the text in your tweet, which offers a more immersive experience. You still have the old way of tweeting photos and videos when you go click the Tweet icon. This lets you add filters, stickers, enchance the image with built-in tools and more that are not available in the new camera. Twitter said that it is rolling out the new camera features to all the Android and iOS users over the next few days, so you should get it soon, if it’s not available already. Earlier this week Twitter started rolling out its new Twttr experimental beta app to let users test new features.